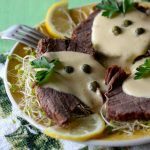 Vitel toné, also called ternera atunada, is a Christmas classic recipe that is originally from Italy where it’s called vitello tonnato. It is composed of slices of veal that are served with a creamy anchovy and tuna-based creamy sauce. Vitello tonnato started to appear in cookbooks in the northern region of Piedmont, which was attached to the coastal Liguria region at the time. This is the region where tuna was canned, but also where oil, lemons and capers, other ingredients of tonnato sauce, were traded. At the time, tuna was actually considered a condiment. What vitello tonnato did not include back then was mayonnaise as it is more of a twentieth century addition. It is believed that tuna was pounded with the capers and oil to produce a creaminess that was eventually recreated with mayo. 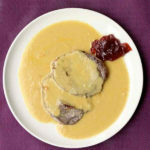 Even though it is a rather traditional dish with a lot of history, there is not one recipe of vitel toné but rather different variations based on a basic recipe. 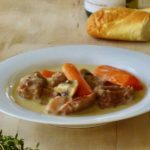 Some chefs say that you need to brown the veal roast in olive oil, then simmer it with carrot, onion, celery, white wine and bay leaf. Other chefs insist on braising the veal in unsalted water with vegetables. Some make the sauce with olive oil and then add canned tuna in oil. 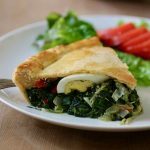 Others favor mayonnaise, either store-bought or homemade, and prefer to use canned tuna in water, drained. You will often see layers of veal entirely covered with sauce so that the veal can barely be distinguished. 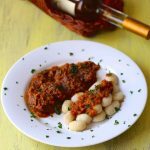 Others prefer to serve the veal with a little bit of sauce on the side. This is not a common way of serving vitel toné as the sauce is supposed to infiltrate the veal for several hours, sometimes days. The meat broth is used to thin out the sauce until reaching the right consistency. If you have some leftover broth, why not use it to make risotto as it is often recommended? Classic cuts for vitel toné include coscia (leg), girello (top round) or magatello (eye of round). Those cuts allow for long simmering without drying out. More modern recipes sometimes call for fesa (rump). 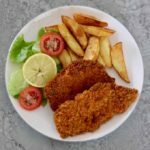 In the US, these cuts of veal are not common, so veal loin is often substituted. Sometimes, less expensive meats such as beef, turkey and pork loin are used as well. One thing for sure, the meat must ideally be of an attractive pink color. The first documented recipe of vitello tonnato was in the Italian cooking bible La scienza in cucina e l’arte di mangiar bene (Science in the Kitchen and the Art of Eating Well) in 1891. Hard to believe but this cookbook by Pellegrino Artusi, a rich merchant turned cooking enthusiast, is one of Italy’s most-read books, along with Pinocchio and The Betrothed! Prior to that date, there are mentions in other cookbooks of a recipe for “rested veal”, a dish where the meat is boiled, sliced and left to rest after being covered with a little sauce containing anchovies. Indeed, tonnato sauce, one of the most copied Italian sauces in the world initially had nothing to do with mayonnaise or tuna, but did contain plenty of anchovies. 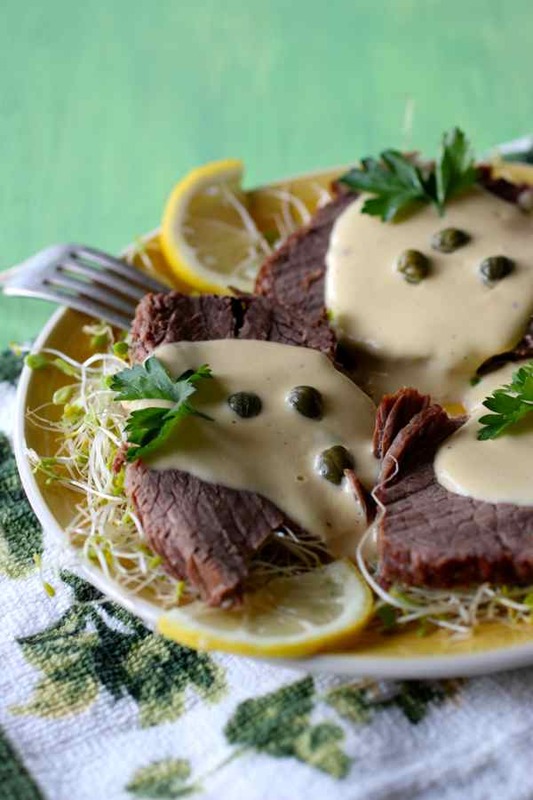 Vitello tonnato is definitely a summer dish that is served as an antipasto or as a light secondo piatto (second dish). 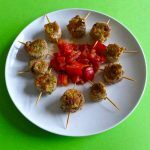 In Lombardy, the recipe is associated with the summer holiday of Ferragosto on August 15, which coincides with the catholic holiday of the Assumption of Mary. In Argentina, vitel toné has become a traditional Christmas dish. Don’t forget that it is summertime right now in this Latin American country at the southern tip of the South American continent. I have to admit that I am not used to cooking land and sea animals together, but I was willing to give it a try. We ate the dish at room temperature after it had been out of the refrigerator for about 30 minutes. The meat had absorbed the flavors of the sauce for at least 3 hours. The meat was absolutely delicious and tender. The creaminess of the sauce is perfectly balanced by the salty and fishy ingredients. Somehow, this meat and fish combination works perfectly. My kids loved it but I still waited until they finished their plate to tell them they just had anchovies… and they still said they loved it. A real success at home for this improbable recipe that even my wife Anne adored. I loved the sauce so much that I will probably try it on other meats or fish. Viva Italia. Viva Argentina. And Merry Christmas everyone! 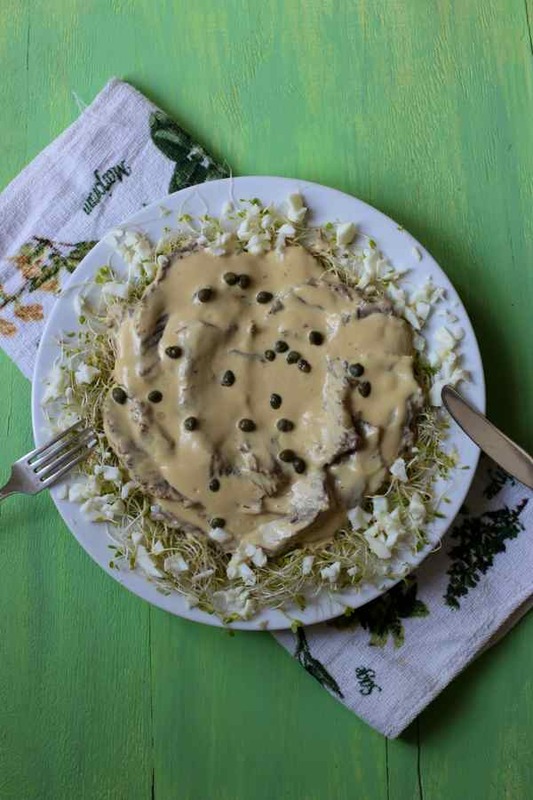 Vitel toné is a classic Christmas Argentinian dish originally from Italy, which consists of veal slathered with an anchovy and tuna-based creamy sauce. Clean meat of fat. In a large pot, sear meat for a couple minutes on each side. Add the onion, carrot, garlic, celery, parsley, bay leaf, and cover with water. Add salt to taste. Cook until just tender, about an hour and a half, or 30 minutes in a pressure cooker. Allow meat to cool in the liquid. Take meat out and cut into very thin slices with an electric knife or a sharp knife. In a blender, add yolks of 8 hard-boiled eggs and well drained tuna. Add olive oil gradually while blending and blend until obtaining a smooth and homogeneous sauce. Add about ½ cup of the strained cooking broth and continue blending. Add the mustard, anchovies, mayonnaise, lemon juice and black pepper. Blend until well mixed. If the sauce is not liquid enough, add more broth. Arrange sliced meat on a large platter and cover with the sauce. Sprinkle capers on top. Grate the remaining whites of the hard-boiled eggs, and sprinkle around the meat on the edges of the platter. Leave the vitel tone a few hours in the refrigerator so the meat can absorb the flavors. Serve cold or at room temperature. 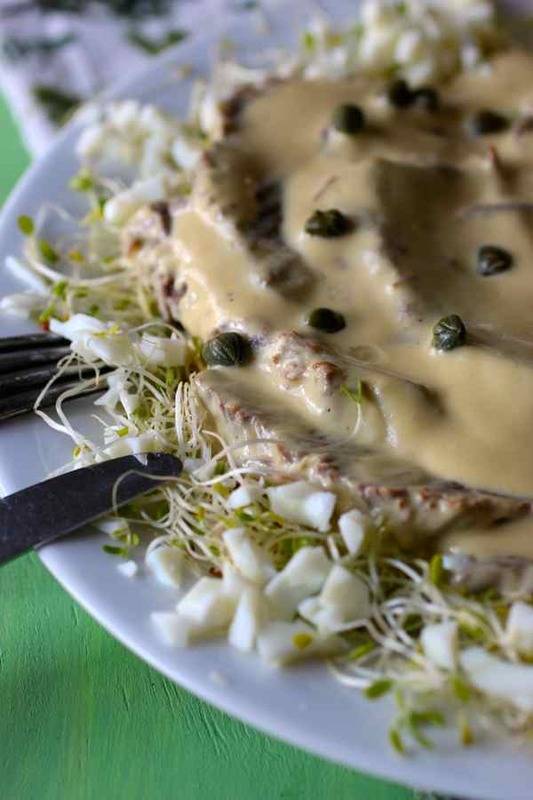 You can also serve the vitel tone on a bed of salad or alfafa sprouts. I Will definitely try this one, This look and sounds wonderful ! !I love the interesting story of blog!! Thank you!! Thanks for this post, I’m argentinean and was unsure of how to describe this recipe to my South African family, and got all the info I needed here 🙂 so glad you enjoyed vitel tone, can’t wait to try the recipe out in CT! Thanks so much for your comment Rose. Please tell us how yours turn out!